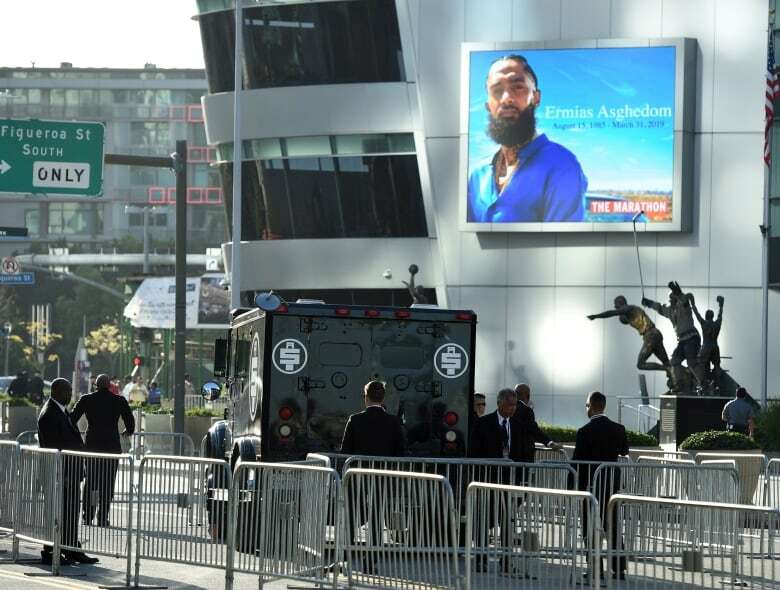 Nipsey Hussle's public memorial service kicked off with songs from his Grammy-nominated album Victory Lap, as family, friends and 21,000 others filled the Staples Center to honour the rap star's life and legacy. 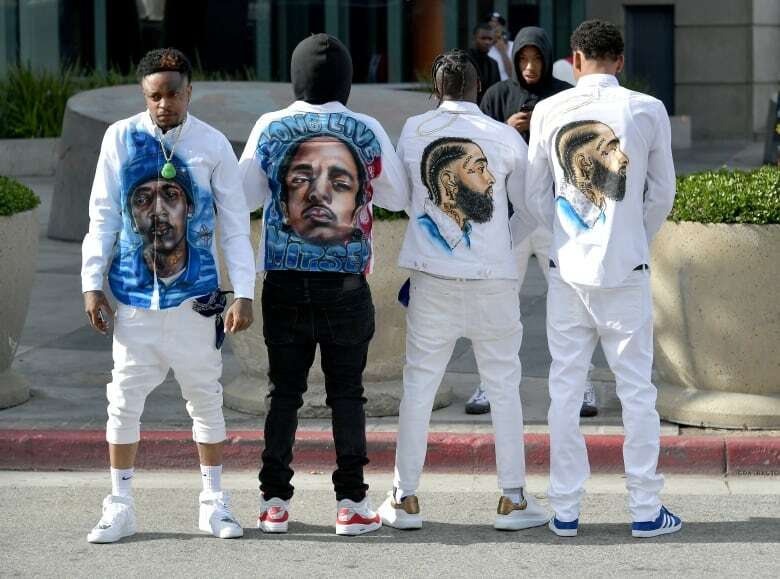 Nipsey Hussle's legacy as a community activist, uniter, a doting father and a loving son were underscored at his public memorial service on Thursday, with deeply personal testimonies from those closest to the rapper — including his mother, who said she was at peace with the death of her son, whom she hailed a "superhero." "He had such beautiful energy," Angelique Smith, dressed in all white, said as she remembered her 33-year-old son, whose given name was Ermias Asghedom. Standing onstage with Hussle's father, Dawit Asghedom, in front of a capacity crowd of 21,000 at the Staples Center, she declared: "Ermias was a legacy." Hussle's children and fiancée, actress Lauren London, also appeared onstage to pay tribute to Hussle. London was with another woman and Kross, her 2-year-old son with Hussle; Hussle's daughter Emani Asghedom; another child and Cameron Carter, her son from a previous relationship. At the memorial, Father Thomas Uwal read a scripture in Tigrinya — the native language in Eritrea, the African country where Hussle's father was born — and spoke of Hussle being "proud to be an Eritrean-American." The service had kicked off with songs from Hussle's latest Grammy-nominated album, Victory Lap. "Everybody put your hands in the air," the DJ directed the crowd as one of Hussle's songs played. "It's a celebration." R&B singer Marsha Ambrosius sang the Mariah Carey song Fly Like a Bird while fighting back tears. "This is for Nipsey, y'all" she said as she tried to gain her composure before she began. A montage of photos featuring the rapper through infancy, childhood and adulthood was shown to the crowd, set to Frank Sinatra's My Way. Anthony Hamilton invoked the spirit of a church service as he performed in Hussle's honour. Blogger and media figure Karen Civil read a letter sent by former U.S. president Barack Obama. Hussle was slain last month in front of The Marathon, a clothing store he owned and that he tried to use to empower his South Central neighbourhood. Most who attended the memorial Thursday were young adults, but ages ranged from small children to the elderly. "We're not just here to get off work. We're not just here to take selfies outside Staples; we can do that anytime," said Wutup Levy, 27, of Long Beach, Calif.
"We're here for a great man. We're all here for big Nip. It wasn't his time." 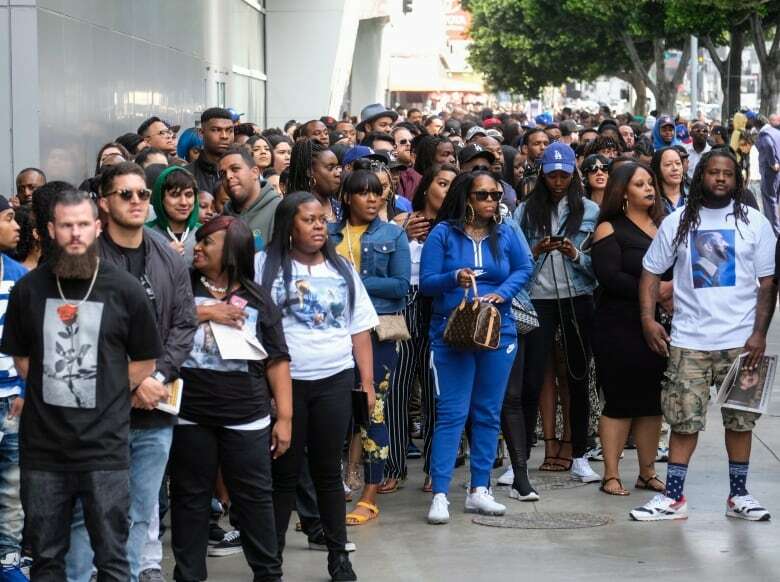 Daren B. Harris waited outside the arena before the doors opened with his grandmother and other family members, who wore black T-shirts with Hussle's face on them. Harris said he grew up listening to the rapper's music and followed his journey to improve his community. "This is a once in a lifetime thing," said Harris, 23, who lives in South Los Angeles. "He was a treasure." Books with an image of Hussle on the cover were handed out to service attendees. Nearly 100 pages long, it contained numerous photos of the rapper, with his fiancée, his children and friends like Russell Westbrook and Snoop Dogg. It also included heartfelt messages from Rick Ross, The Game and LeBron James. 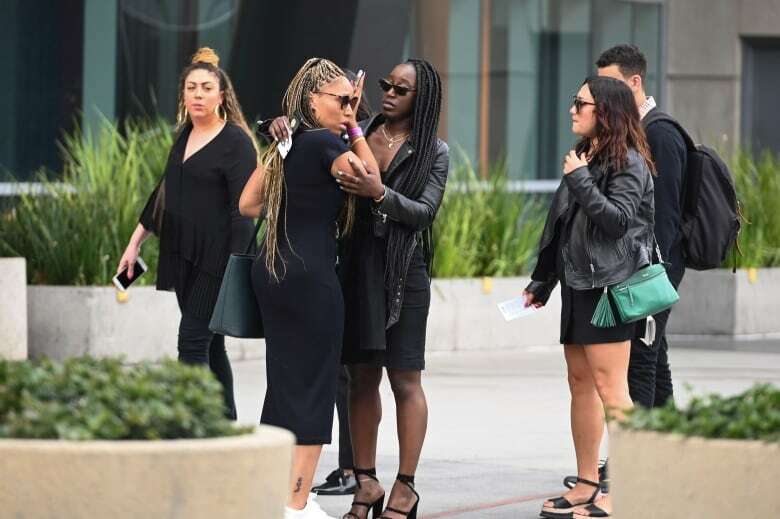 "I've never cried myself to sleep over any public figure before, but Nipsey's presence meant so much for our community," actress Issa Rae wrote in a message inside the book. 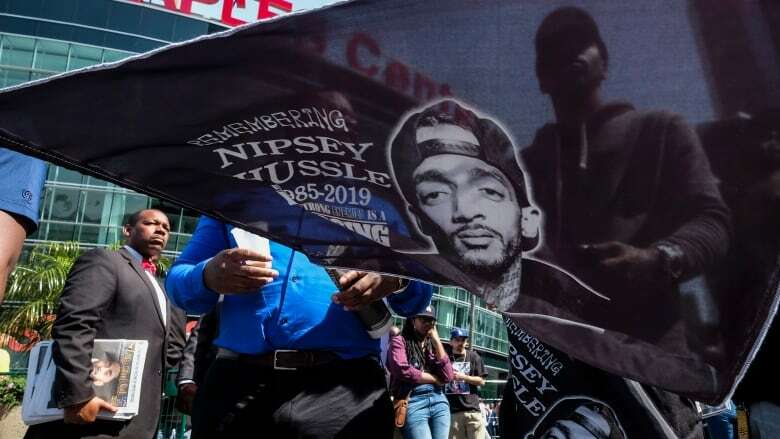 After the funeral, a hearse carrying Hussle's coffin was scheduled to to go on a 40 km lap through the city, including past the property where Hussle had planned to turn an aging strip mall into new businesses and affordable homes. Finally, it will arrive at a funeral home in the city's hard-scrabble Crenshaw district, where the rapper was born on Aug. 15, 1985. Hussle's South Los Angeles clothing store will also be one of the places passed during the procession. Eric R. Holder Jr., who has been charged with killing Hussle, has pleaded not guilty. According to police, Holder and Hussle had several interactions the day of the shooting, described as being the result of a personal dispute. 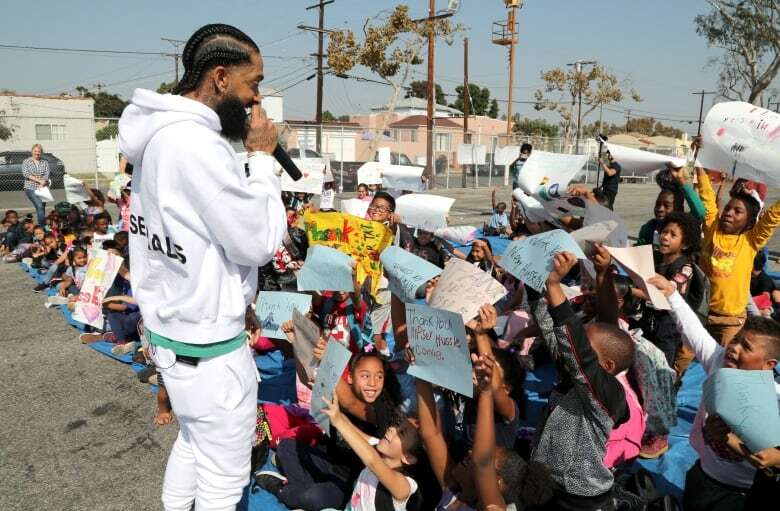 The 33-year-old Grammy-nominated rapper was a beloved figure for his philanthropic work that went beyond the usual celebrity "giving back" ethos. Following his death, political and community leaders were as quick and effusive in their praise as his fellow hip-hop artists. Hussle recently purchased the strip mall where The Marathon is located and planned to redevelop it, part of his broader ambitions to remake the neighbourhood where he grew up and attempt to break the cycle of gang life that lured him in when he was younger. For a decade, he released much sought-after mixtapes sold out of the trunk of his car, helping him create a buzz and gain respect from rap purists and his peers. His said his stage name, a play on the 1960s and '70s rhyming standup comic Nipsey Russell, was given to him as a teen by an older friend because he was such a go-getter — always hustling. He charged $100 for his 2013 mixtape Crenshaw, scoring a cash and publicity coup when Jay-Z bought 100 copies for $10,000 US. Last year, he hit new heights with Victory Lap, a critically acclaimed major-label debut album on Atlantic Records that made several critics' best-of lists. The album debuted at No. 4 on Billboard's 200 albums charts and features collaborations with Kendrick Lamar and CeeLo Green. It earned him a Grammy nomination, though he lost to Cardi B's Invasion of Privacy.